Kid And Pet Friendly Modern Townhouse In Heart Of Nw Portland! Modern, large yet cozy 2 bedroom Townhouse, both bedrooms with queen beds and full ensuite's. Internal attached garage. Large, sunlit, window filled, vaulted ceiling, open plan living/dining room with 2 full large couches, chairs, futon and cozy gas fireplace. Fully equipped new kitchen with dishwasher, oven, stove, pantry and all utensils needed for cooking and dining in. Central heating/cooling system throughout. Brand new Washer and Dryer. Fast Wifi 120Mbps/Cable TV. Perfect location in beautiful Alphabet District, Starbucks across the road, next to 21st St and 23rd St with amazing bars and dining. 5 minute walk to Pearl District, 10 minute walk to downtown and riverfront. Public Max/Streetcar tram stop 20 feet away on the corner at 21st Street! It takes you everywhere, even the airport! Gas station is on the corner for easy refueling! Fine and Casual Dining/Restaurants steps away from the condo, Craft Breweries, Independent Movie Theaters, Galleries, Music, Shopping, Timbers Soccer Stadium 5 minute walk, Blazer's Stadium 10 minutes by Max line. Portland University and Portland Zoo 15 min by Streetcar/Max. Portland Airport easy access by streetcar/Max. Please see for FREE APPS for your smartphone or mobile device to guide you using public transportation including purchasing online tickets. Uber is $5 to Pearl or Downtown and $25 to airport. Cancellation within 30 days of arrival forfeits your payment after booking. This is not a party house! More than the max guests and you will be cancelled and asked to leave immediately. Mariana and Luke! Mariana is from Argentina and Luke is from Australia. We moved to Portland 4 years ago for Luke's work. We love to travel and spend most of our time traveling the world for Luke's job. We fell in love with Portland and especially the Alphabet District, with 21st and 23rd St. We speak English, (Aussie), Spanish, some French, Italian, German and Swedish. We invite you to our beautiful townhouse so you can enjoy the beautiful city of Portland like a local as we do! We bought this property as we love the area so much, we rented around the corner for 2 years and fell in love with the location and area. So we bought here 2 years ago, its location is perfect for everything, 25 mins to International airport, just over an hour to the magnificent NW coast, walking distance to everything else in Portland. The Max Tram on the corner was great for Mariana to get to Uni and downtown, and the internal garage was great for Luke to drive to work and airport for flying constantly. Internal Garage that walks into the house is so rare in Portland, the Max Tram on the corner makes getting around so quick and easy, 21st and 23rd Street for food, drinking and shopping! The vaulted ceilings and full length windows allow so much light into this beautiful home, with open living/dining all the way to the kitchen. We are very social people and like to chat while we cook and entertain. The gas fireplace in winter makes it so cozy to snuggle up on the couch and watch HBO ;) The bedrooms are so nice and cozy as well to get a good nights sleep for all the activites the next day! toilet, combination tub/shower, Double his/hers sink, vaulted ceiling and sky light! Right in the heart of the NW Alphabet District. 5 mins walk to The Pearl, 10 mins walk to center of Downtown. 21st and 23rd Restaurants, Bars and shopping steps from the front door! Central air con/heating, does the whole house. Central air con/heating for the whole house, every room. Plus full gas fireplace in living room. Secured internal garage attached to townhouse, walk straight into the house. Very rare in Portland. Note cars bigger than Subaru Outback may not fit, see photos or contact to ask. All dishes for your needs, plates, bowls, cutlery, salad bowls, serving dishes, all pots pans and utensils. Beautiful full kitchen with breakfast bar, opens to dining and living room for social cooking! Dishwasher, double sink, garbage disposal in sink, oven, microwave, fridge, freezer with ice machine. Dining table for 8 adults, plus breakfast bar and coffee table folds up for dining at the TV. Full size TV with remote in living room, HDMI cable, wifi access for Netflix, and cable TV including HBO! TV in Master bedroom, with internet access for Netflix, HDMI cable. Basic Cable, HBO, Sports Channels. Books for reading, please leave. Front Patio at entrance, for smoking in privacy. 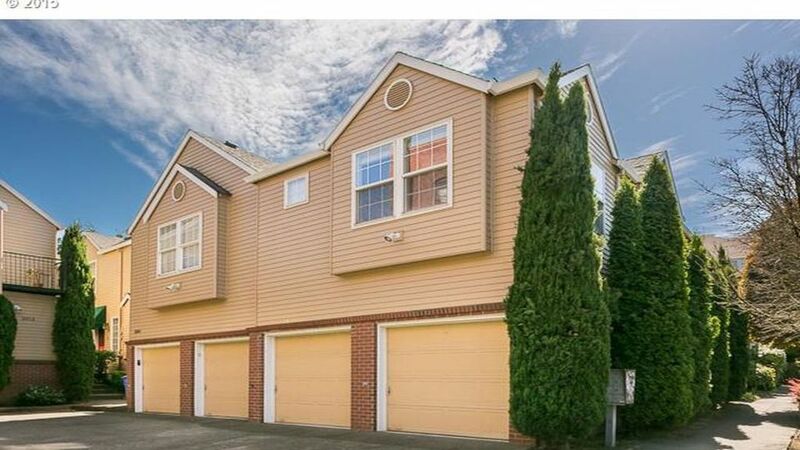 Gorgeous Townhouse with a location unbeatable, close to all Portland has to offer, Max Tram on the corner, UBER easy to pick up, Internal garage for driving, Pet and Child Friendly, this house has it all with a charm and warmth to help you relax after a full day of exploring! wonderful townhome, great neighborhood, many amenities ! The townhouse was very comfortable and well equipped. I stayed there with my family and needed nothing! We were very grateful for the pack and play, high chair and baby gate to accommodate my granddaughter. I was concerned after reading the reviews about the garage but we had no trouble parking a chevy traverse. There are many quaint restaurants, coffee shops and stores within close walking distance. Blue Star donuts for breakfast was my favorite. I cannot thank Mariana and Luke for their wonderful hospitality! We hope to return and stay there again when we have more time! Overall very nice. A great location in North West Portland, just off 23rd. A few cosmetic issues were present, but nothing bothersome. Clean, great location. Attentive and very hospitable hosts. Stayed for a week and a half while in town for end of year meetings. Owners answered questions very timely and home was comfortable, well stocked , and clean. Will definitely stay here again next trip. We thoroughly enjoyed our time at your property in NW Portland! The location can't be beat. We walked to so many wonderful cafes, shops and restaurants and even up to Forest Park for a hike in the woods. The comfy beds, open living space and well stocked kitchen made us feel right at home and was perfect for reconnecting with our family. We will quite likely return as we couldn't imagine finding a place that would suit our needs any better. The lovely bottle of Malbec was a nice touch, too! We loved staying here for just over a month with our kids. The location is amazing- you can walk outside and hop on the streetcar. We took it often to the Children’s Museum, food trucks and even to the airport. Walking to 23rd was also a huge bonus! The townhome is clean and has everything you need. We loved it! Fitness First 5 mins walk, Safeway, Fred Meyers and 4 Seasons supermarkets all a 5 min walk away! Hospital 2 min walk up on 21st. All the bars and restaurants you could wish for on 21st and 23rd street.